Are you ready to learn all about Apnea of Prematurity and Bronchopulmonary Dysplasia? I sure hope so because that is what this study guide is all about. As you will see below, this post is loaded with helpful practice questions that are specifically designed for Respiratory Therapy student. You can use this information to ace your exams in the Neonatal/Pediatric Care classes in school So are you ready to get started? 1. What is characterized by cycles of hyperventilation followed by short apneic pauses of less than 3 seconds? 2. What is the purpose of central chemoreceptors? They increase ventilation in response to low cerebral spinal fluid pH. 3. How is apnea of prematurity defined clinically? Cessation of breathing for >20 seconds with bradycardia and hypoxemia for >10 seconds. 4. Which of the following are considered detrimental consequences of apnea in neonates? 5. What long-term treatments are available to treat or prevent apnea of premature? Methylxanthine, Nasal cannula, Blood transfusions, NCPAP, and Caffeine citrate. 6. At what age do most infants resolve apnea issues? 7. What risk factors increase the likelihood for more severe bronchopulmonary dysplasia? Surfactant therapy and Nosocomial infection. 8. Which of the following are strategies to consider for the treatment of respiratory distress syndrome to minimize the risk of bronchopulmonary dysplasia? Arterial oxygen tension >90mmHg, Surfactant administration prior to MV, Extubating to NIPPV in the first month of life. 9. What is essential for the optimal growth of cells and tissues? 10. What is the diuretic of choice for ventilator-dependent infants with evolving or established bronchopulmonary dysplasia (BPD)? 11. What is apnea of prematurity (AOP)? A sudden cessation of breathing that lasts for at least 20 secs or is accompanied by bradycardia or oxygen desaturation in an infant younger than 37 weeks gestation. 12. What are the causes of apnea in premature infants? Incorrect neural signaling and airway obstruction. 13. What is periodic breathing? A benign, abnormal form of breathing with cycles of hyperventilation followed by short apneic pauses of <3 seconds. 14. What 2 things can stimulate apnea of prematurity? High humidity cannula and caffeine. 15. When is CPAP indicated? For obstruction like tonsils pushing it out of the way. 16. What are the 3 classifications of Adverse Outcome Passage (AOP)? Central, obstructive, and mixed apnea. 17. What is the cause of central apnea? A dysfunction of the nerve centers in the brainstem to send signals to the muscles of respiration, and no attempt at inspiration can be observed. 18. How would you fix central apnea? 19. What is the characteristics of obstructive apnea? Some attempt to ventilate, resulting in chest wall movement but without gas entry, usually caused by an upper airway obstruction. 20. What is the airway like in obstructive apnea and the treatment? Airway is floppy, and treatment is CPAP. 21. What is mixed apnea? It consists of obstructive respiratory efforts, usually following central pauses, and is probably the most common type of apnea. 22. What is the treatment for mixed apnea? 23. What is the primary role of the respiratory control system? To regulate ventilation to supply the O2 needs of the body and to remove CO2. 24. Where does control of ventilation occur? 25. What is the dysfunction of the respiratory control system? It is the primary cause of the central apnea component of AOP. 26. What kind of medications are used to treat apnea of prematurity? 27. What do methylxanthines do? It stimulates respiratory drive, increases diaphragmatic activity, increases VE, enhances chemoreceptor sensitivity to CO2, reduces periodic breathing, reduces hypoxic respiratory depression, increases metabolic rate, increases O2 consumption, and stimulates diuresis. 28. What can alleviate anemia that can cause irregular breathing in preterm infants? Blood transfusions because blood carries oxygen. 29. How is a nasal cannula used to prevent obstructive apnea? Mild positive pressure in the upper airway to prevent it. 30. How does a nasal cannula prevent central apnea? It uses tactile simulation in the nares as a way to prevent it. 31. What does noninvasive ventilation do for apnea of prematurity? NCPAP and NIPPV provide positive pressure that reduces the likelihood of upper airway collapse. 32. How can body positioning help in apnea of prematurity? Prone positioning can improve thoraco-abdominal synchrony and stabilize the chest wall. 33. What is stimulation like in apnea of prematurity? It can be tactile or kinesthetic. 34. What are the treatments for apnea of prematurity? Blood transfusions, nasal cannula, noninvasive ventilation, body positioning, and stimulation. 35. What is the NICU’s observation period prior to discharge for an apnea-free time? Usually 3-8 days and after discontinuing caffeine citrate. 36. Can premature infants be sent home with caffeine citrate? Yes, it provided with a home cardiorespiratory monitor. 37. What is essential prior to discharge of an apnea of prematurity baby? Family education and training are provided with basic life support course. 38. 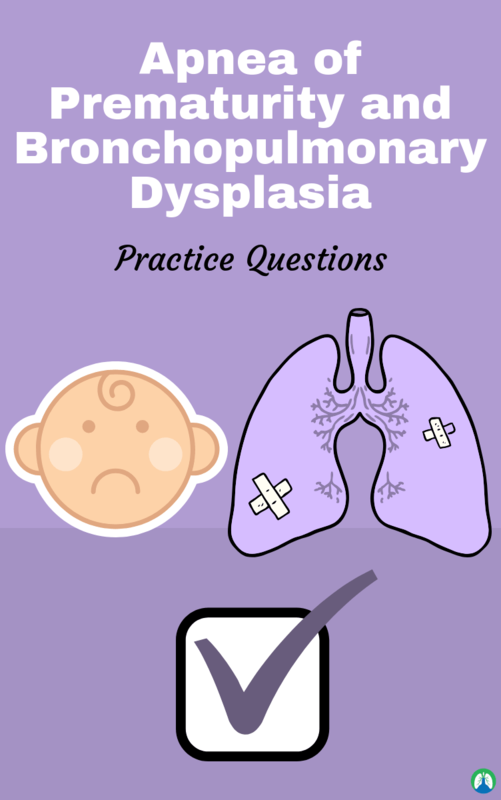 What is bronchopulmonary dysplasia? A type of chronic lung disease, currently defined as the need for supplemental oxygen for at least 28 days after birth, assessed at discharge or when the baby is close to their estimated full-term age. 39. What does intubation cause? 40. What constitutes mild bronchopulmonary dysplasia? No supplemental O2 required at the time of evaluation (28 days after birth). 41. What constitutes moderate bronchopulmonary dysplasia? FIO2 <30% and/or PPV or NCPAP at time of evaluation. 42. What constitutes severe bronchopulmonary dysplasia (BPD)? FIO2>30% and/or PPV or NCPAP at time of evaluation. 43. What does dysplasia mean? It causes airways to grow differently. 44. Describe the development of new BPD? Gestational age <28, birth weight <1000 grams, hypothermia at admission, hypotension at admission, RDS, need for prolonged MV, hypercarbia, need for surfactant therapy, higher fluid therapy, nosocomial infection, more than 2 blood transfusions, and preeclampsia. 45. What is severe BPD? Acidosis at admission, surfactant therapy, nosocomial infections, PDA, oligohydramnios, and Apgar score <6 at 5 mins. 46. What is management and treatment for bronchopulmonary dysplasia? Guaranteed prevention: prevent premature birth, minimal O2 use, exogenous surfactant, open lung ventilation, and gentle ventilation strategies, corticosteroids, caffeine citrate, mast cell, stabilizers, inositol, antioxidants, inhaled nitric oxide, treatment of pulmonary edema, fluid restriction, diuretics, and bronchodilators. 47. What is the prognosis for individual patients with BPD? It is relatively unpredictable, and the course can vary widely. 48. What do infants with BPD exhibit? Some degree of obstructive lung disease that can persist into adolescence and young adulthood. 49. What do BPD patients often have? Repeat hospitalizations, abnormal PFT results, and the need for home supplemental O2. 50. How are spirometry values in survivors with BPD? 51. What do infants with BPD have frequently? Respiratory exacerbations, recurrent respiratory symptoms and infections. 52. What are the BPD meds? Oxygen, diuretics, and respiratory medications. 53. What is neurocognitive dysfunction? BPD is a major predictor of poor neurodevelopmental outcomes, increased rate of cerebral palsy, developmental delays, and poor neuromotor outcomes at 6 months of age. 54. What is Apnea of Prematurity? It is a sudden cessation of breathing that lasts for at least 20 secs or is accompanied by bradycardia or oxygen desaturation in an infant younger than 37 weeks gestation. 55. What are the causes of apnea in premature infants? 56. What is AOP caused by? The physiological immaturity of the neurological & chemical receptor systems of the body that regulate respiration & respond to hypoxemia & hypercapnia. 57. What is Periodic breathing? A benign, abnormal form of breathing w/ cycles of hyperventilation followed by short apneic pauses of <3 secs. 58. How can AOP be classified? 59. What is central apnea? It caused by a dysfunction of the nerve centers in the brainstem to send signals to the muscles of respiration & no attempt at inspiration can be observed. 60. What is obstructive apnea? It is characterized by some attempt to ventilate, resulting in chest wall movement but without gas entry, usually caused by an upper airway obstruction. 61. What is mixed apnea? It consists of obstructed respiratory efforts, usually following central pauses, and is probably the most common type of apnea. 62. What is the primary role of the respiratory control system? To regulate ventilation to supply the oxygen needs of the body & to remove CO2. 63. What does the control of ventilation occur? The brainstem with central & peripheral chemoreceptors helping plays a role. 64. What is the primary cause of the central apnea component of AOP? Dysfunction of the respiratory control system. 65. What is a nasal cannula? Mild positive pressure in the upper airway to prevent obstructive apnea & tactile stimulation in the nares as a way to prevent central apnea. 66. What is noninvasive ventilation? NCPAP & NIPPV provides positive pressure that reduces the likelihood of upper airway collapse. 67. How does body positioning play a role? Prone positioning can improve thoracic abdominal synchrony & stabilize the chest wall. 68. What is the major developmental milestone of premature infants? Resolution of apnea & establishment of a normal respiratory pattern. 69. How long is the NICU’s required observation period prior to discharge? Usually 3 to 8 days and after discontinuing caffeine citrate. 70. What can premature infants be sent home with? Caffeine citrate & provided with a home cardiorespiratory monitor. 71. What role does family play in the discharge of a patient? Education & training is essential prior to discharge & should be provided with a basic life support course prior to discharge. 72. What is bronchopulmonary dysplasia (BPD)? A type of chronic lung disease, currently defined as the need for supplemental O2 for at least 28 days after birth, assessed at discharge or when the baby is close to his or her estimated full age. 73. When to evaluate BPD? At 36 weeks postmenstrual age or discharge to home (whichever comes first), and at >28 days but <56 days post-natal age or discharge to home (whichever comes first). 74. What is mild BPD? No supplemental O2 requirement at time of evaluation. 75. What is moderate BPD? Need for FiO2 < or = 0.30 &/or PPV or NCPAP at time of evaluation. 76. What is severe BPD? Need for >0.30 fio2 &/or PPV or NCPAP at time of evaluation. 77. What are the risks factors for the development of BPD? Gestational age </= 28 weeks, birth weight </= 1,000 grams, hypothermia &/or Hypotension at admission, RDS, need for prolonged MV, hypercarbia (paCO2 >50 mmHg), need for exogenous surfactant therapy, higher fluid therapy, nosocomial infection, more than two blood transfusions, chorioamnionitis, preeclampsia, acidosis at admission, surfactant therapy, nosocomial infections, PDA, oligohydramnios, and Apgar Score <6 at 5 mins. 78. What are the airway characteristics for BPD? Fibroproliferative airway injury, smooth muscle hyperplasia, varying amounts of smooth muscles, and minimal damage present. 79. What are the alveoli characteristics for BPD? Fibrosis of alveolar tissue, emphysematic changes, heterogeneous pattern of atelectasis & over inflation, alveolar hypoplasia, fewer & larger, and less evidence of direct damage to alveolar tissue. 80. What are the pulmonary vasculature characteristics of BPD? Thickening of the basement membrane, subsequently increasing A-C membrane distance, decreased vasculature, and lower A-C membrane area. 81. What are the management & treatment of BPD? Guaranteed prevention premature birth prevention, minimal O2 use, exogenous surfactant, open lung ventilation & gentle ventilation strategies, corticosteroids, caffeine citrate, mast cell stabilizers, vitamin A, inositol, antioxidants, inhaled NO, treatment of pulmonary edema, fluid restriction, diuretics. And bronchodilators. 82. What is the prognosis for individual patients with BPD? It is unpredictable & the course can vary widely. 83. What do infants with BPD exhibit? Obstructive lung disease that can persist into adolescence & young adulthood. 84. Patients with BPD may typically have repeat what? Hospitalizations, abnormal pulmonary function results & the need for home supplemental O2. 85. What are the spirometry values that are consistently lower with BPD? FEV1, FVC, forced expiratory flow at 25 % to 75% of the FVC, and shows substantial airway obstruction & alveolar hyperinflation. 86. Do BPD patients need home oxygen? Yes. One study reported that 40% of preterm infants diagnosed w/ BPD required supplemental home O2. 87. What are respiratory exacerbations? 88. What is neurocognitive dysfunction? BPD is a major predictor of poor neurodevelopment outcomes. It increased rate of cerebral palsy. Its developmental delays and poor neuromotor outcomes at 6 months of age. 89. What is the economic impact of BPD? Chronic health problems associated w. BPD have a major impact on a family’s daily lives after the neonatal period, home O2 can impact the quality of life of families, families incur greater comes for the following prescriptions & respiratory related care. And that wraps up our study guide on Apnea of Prematurity and Bronchopulmonary Dysplasia. I hope this information for helpful for you and I confident that these practice questions can help you learn everything you need to know in order to ace your exams. Thanks for reading and as always, breathe easy my friend.